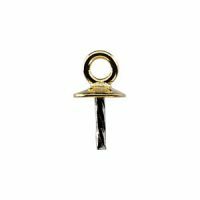 Description: A screw eye with cup for half drilled pearls or gemstones beads. The cup is 3.0 mm in diameter and is intended for up to a 5.0 mm pearl or gemstone bead. This type of pearl cup works well as a replacement for the pearl dangles on the end of antique lavalieres. The ring is closed but can easily be cut open for attachment. Sold individually. Measurements: 1.2mm inside diameter jump ring on cup.